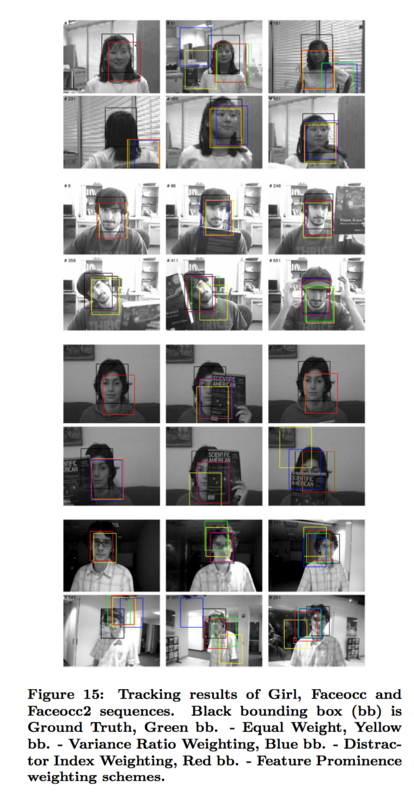 This paper introduces a new mechanism called Feature Promi- nence to combine evidence from multiple feature operators for more reliable target detection and localization during video tracking. Feature prominence is measured using the statistical p-value estimated from a non-parametric local kernel density estimate of the a posteriori feature distri- bution. More prominent features have lower p-values and this ordering can be used to either discard low prominence features (high p-values) or reduce their weight during the feature fusion process to produce a more reliable fused fea- ture likelihood map for locating the target at a subsequent time during tracking. The proposed feature fusion method is embedded into a test tracking system. Then, detection and tracking performance of the system is evaluated. Ex- perimental results indicated that feature prominence out- performs several other feature fusion methods. S. Candemir, K. Palaniappan, F. Bunyak, G. Seetharaman, and R. Rao. Feature prominence-based weighting scheme for video tracking. 8th Indian Conference on Computer Vision, Graphics and Image Processing, 2012.